Ptosis (eyelid drooping) in infants and children is when the upper eyelid is lower than it should be. This may occur in one or both eyes. Eyelid drooping that occurs at birth or within the first year is called congenital ptosis. Ptosis in infants and children is often due to a problem with the muscle that raises the eyelid. A nerve problem in the eyelid can also cause it to droop. Eyelid drooping that occurs later in childhood or adulthood may have other causes. The health care provider will do a physical exam to determine the cause. 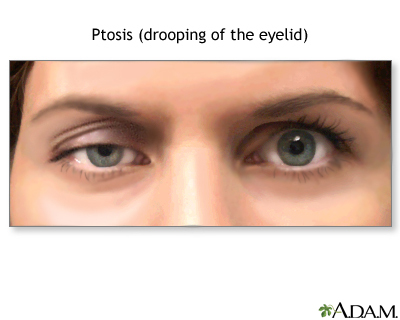 Other tests may be done to check for diseases or illnesses that may be causing ptosis. Eyelid lift surgery can repair drooping upper eyelids. If vision is not affected, surgery can wait until age 3 to 4 when the child has grown a little bigger. In severe cases, surgery is needed right away to prevent "lazy eye" (amblyopia). Wear an eye patch to strengthen vision in the weaker eye. Wear special glasses to correct an uneven curve of the cornea that causes blurred vision (astigmatism). Children with mild ptosis should have regular eye exams to make sure amblyopia does not develop. Surgery works well to improve the look and function of the eye. Some children need more than one surgery. Olitsky SE, Hug D, Plummer LS, Stahl ED, Ariss MM. Abnormalities of the lids. In: Kliegman RM, Stanton BF, St. Geme JW, Schor NF, eds. Nelson Textbook of Pediatrics. 20th ed. Philadelphia, PA: Elsevier; 2016:chap 624. Reviewed By: Christopher L. Haupert, MD, Iowa Retina Consultants, West Des Moines, IA. Review proided by VeriMed Healthcare Network. Also reviewed by David Zieve, MD, MHA, Medical Director, Brenda Conaway, Editorial Director, and the A.D.A.M. Editorial team.